We are a family of soup lovers. Though I guess I've always liked soup, I'm pretty sure my affinity for this bowl 'o warmth intensified with each move we made to cooler and cooler climates. 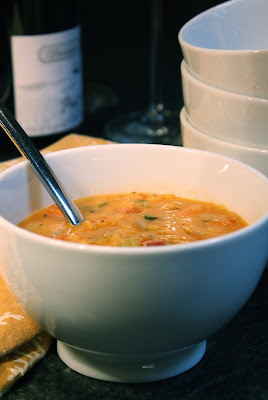 Now living in the Pacific Northwest, with a fairly cool (sometimes cold) stretch of weather and lots of drizzle, there's a pot of soup on our stovetop at least once a week... from the beginning of October to well into May (yes...May!!). 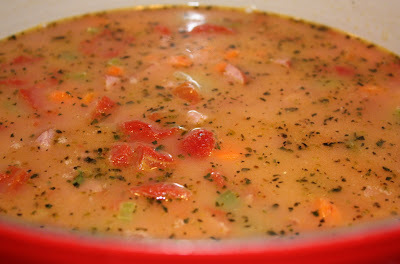 So, it's pretty safe to conclude that there will be many of our favorite soups posted here in the months to come. The great thing about a good bowl of soup is that, in most cases, it's a simple meal in one pot... a great chop, drop and simmer dinner. And, apart from its comforting goodness, soups can have (and hide) a host of ingredients that make it an exceptionally healthy meal choice for a family with picky kiddos. Lentils are nutritious little legumes -- low in fat and high in protein, iron and dietary fiber -- with a pleasant earthy flavor. There are quite a few varieties, ranging from white and yellow to red, brown and black. The red, yellow and white varieties have their husks removed. In general, they cook up fairly quickly (especially the lentils sans husks). 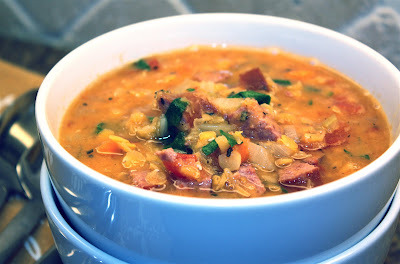 This Red Lentil Soup with Turkey Kielbasa is one of our favorites. It's hearty, flavorful and healthy. The base of this recipe is from the Bob's Red Mill Red Lentil package, changed up a bit from several trials, to this version. I particularly like using chicken broth (instead of water) as I think it gives the soup a more substantial flavor base, and the turkey kielbasa is a great choice if you aren't going strictly vegetarian. Best of all, it comes together really easy. The mirepoix (a fancy french term for what is the base for so many soups...onions, carrots and celery) sautes just until the onion is tender, then you add the sausage and cook it up with the veggies just until it browns lightly and begins to release some of its juices. Then you add your dry ingredients (no salt... just yet)...your broth...and your tomatoes. Let it all simmer lightly for about 30 to 45 minutes. When ready, drop in your fresh chopped spinach, wine vinegar, and salt and pepper (to taste). Salt (or any acidic ingredient) slows the cooking of the lentils so it's best to add it at the end. And, depending on what you use (low sodium broth or no-salt added tomatoes...), the amount of salt you add will vary. 1. Add olive oil to a large pot, over medium heat. Add onions, carrots and celery and cook until onion is tender. 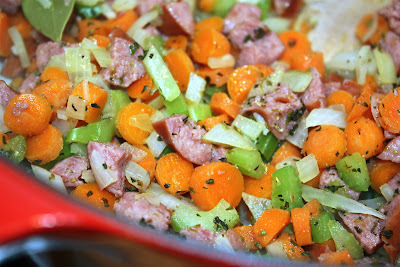 Drop in turkey kielbasa and cook with veggies until just lightly browned, approximately 2 to 3 minutes. Stir in garlic, bay leaf, oregano, and basil and cook for another 2 to 3 minutes. 2. 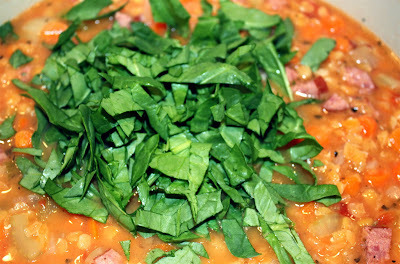 Stir in lentils, broth and tomatoes. Bring to a boil, then reduce and simmer (uncovered) for about 30 to 45 minutes. 3. When ready, drop in fresh spinach and wine vinegar. Cook just until spinach wilts a bit. Season with salt and pepper, to taste.